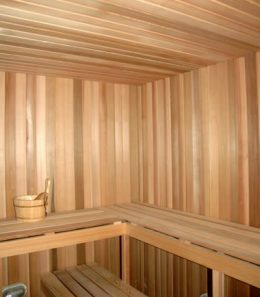 Ukko Saunas can help you to custom-build your sauna into a designated room by providing all the materials and equipment you may need - from Canadian "A" grade clear Red Western cedar panels to the heart of your sauna - heater. We can supply materials not only for the walls and the ceiling of your sauna but also for the benches. We can even custom made your sauna door to your specifications.